This is from a mat of dead Cladophora algae removed from the Columbia River in northern Washington State. The Cladophora can be seen in the background. 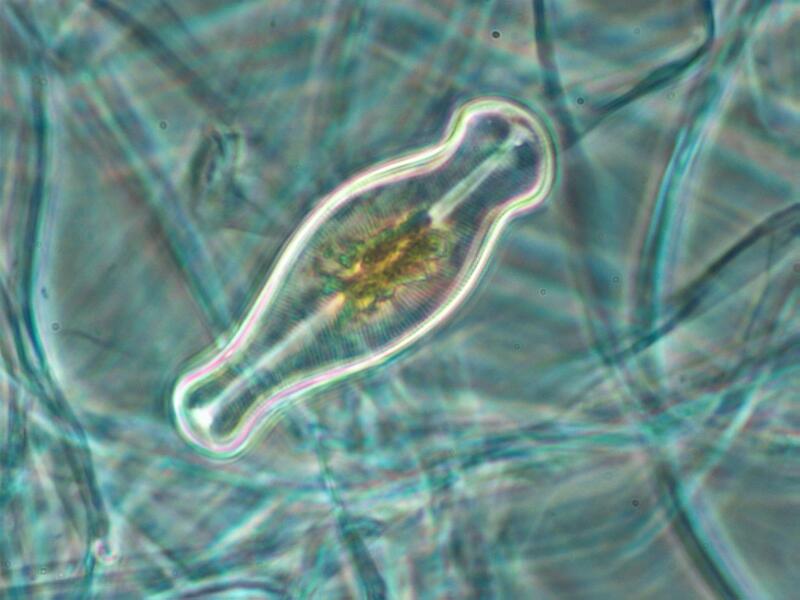 Gomphonema is a form of algae that can produce a undesirable slime in water. It is also used as an indicator of industrial wastes and sewage in water (see ALGAE AND WATER POLLUTION by the US Environmental Protection Agency). A description of Gomphonema is given in THE FRESHWATER ALGAE by G. W. Prescott in the "HOW TO KNOW" series. Its presence in a fresh water stream or river can indicate industial or sewage pollution. Gomphonema is transversely unsymmetrical. There is a bulb at each end with an enlarged midregion. The striae are relatively coarse. U.S. EPA, ALGAE AND WATER POLLUTION, EPA-600/9-77-036, p. 43, Plate II, 1977.